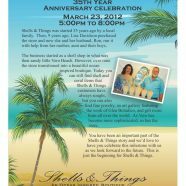 Home » Posts Tagged "Community Events"
You Are Invited: Celebrate Shells & Things 35th Anniversary – TODAY! Shells & Things is celebrating 35 Years in Business, all year long starting with a Champagne Reception today. Stop by any time between 5pm and 8pm tonight. Go by after work, before dinner out or after dinner out, network and toast to their success! Your persoona invitation is below.